Honor 7X also got the Android Oreo-based EMUI 8.0 update that adds AR Lens in the camera app. This allows users to add effects to the images even before the picture is clicked. 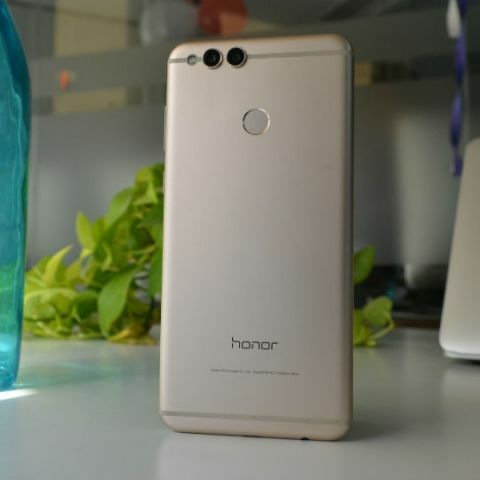 Honor has announced a Rs 1,000 price cut for both the variants of the Honor 7X smartphone (review). As a result, the 32GB variant will be available for Rs 11,999 and the 64GB variant is priced at Rs 14,999. Both the variants will be available on Amazon from June 25. EMI and Exchange Offers are also available for the Honor 7X on Amazon. The phones were earlier available for Rs 12,999 (32GB) and Rs 15,999 (64GB). Apart from the price-cut, the smartphone has also received the EMUI 8.0 update for the Honor 7X in India. Based on Android Oreo, the update brings new features like Face Unlock, Game Suite, Ride Mode and AR Lens. “We are confident that the new updates like EMUI 8.0 based on Android 8.0 with new age features like Face Unlock, Game suite, Ride Mode and AR lens will provide our customers with an enhanced user experience,” P. Sanjeev, Vice President, Huawei Consumer Business Group said. In March, Honor 7X received Face Unlock feature via HOTA (Huawei's Over the air update). In May, the company rolled out Gaming Mode where the phone is automatically optimised for an enhanced gaming experience. There was also a Power saving mode where the phone will be optimized for improved battery life. The Smart Mode optimizes the phone depending upon the current usage and balances the power consumption and performance automatically. Apart from these, Ride Mode has been updated as well. The feature notifies the caller that the user is currently riding and cannot answer calls. Users will also be able to enjoy the AR lens as a part of a new update on the camera app and add effects to images, before the picture has been clicked. Users can also assign a specific fingerprint for the Paytm app, which will land them on the Paytm payment section directly. To recall, the Honor 7X smartphone has a 5.93-inch touchscreen display with 1080 x 2160 pixels display resolution. Under the hood, the device is powered by 1.7 GHz octa-core HiSilicon Kirin 659 processor with 4GB of RAM, and 32GB/64GB/128GB of internal storage that is expandable up to 256 GB via a microSD card slot. The device comes with 16MP + 2MP dual-rear cameras and an 8MP front camera for clicking selfies. It is powered by a 3340 mAh non-removable battery. The Honor 7X is available in Red, Black, Blue and Gold colours.